There is just something about a good steak topped with butter. It’s such an indulgence, and with the change in the weather, I was inspired to give this indulgence of mine a fresher, more vibrant flavor with a seasonal marinade. Something that takes a good steak out of the steakhouse and onto the picnic table to enjoy it al fresco on a warm and breezy Texas evening for us, but it’ll certainly work in any location you find yourself alongside a grill, great company and outdoor backdrop. Add the olive oil, garlic, and shallots, salt, and pepper to taste and simmer on low heat for 3 minutes. Add the sage and simmer for one additional minute. Served with grilled summer vegetables. 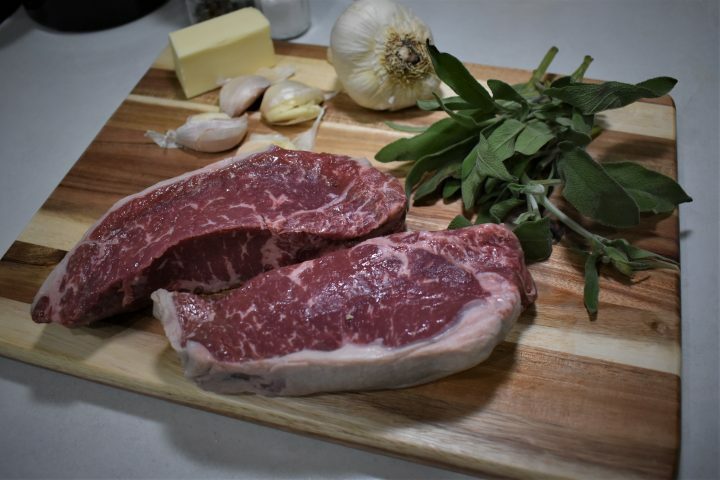 Once this marinade is prepared and cooled very slightly place your steaks in a bowl, add the marinade and toss them, coating them very generously. Grill or prepare your steaks how you like them. I can’t wait to try this yummy steak recipe!